If there's anything more widely available, naturally made, tough as steel and sturdier than concrete, with probably more observed vibration dampening than carbon fiber, its got to be bamboo. 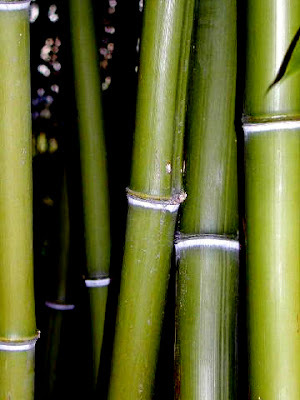 Bamboo (Dentrocalamus strictus) is a natural composite material, in which cellulosic fibres are embedded in a lignin matrix. Cells of bamboo have been categorized into two types: matrix tissue cells and sclerenchyma cells. Matrix tissue cells are leptodermous and act as the matrix. Sclerenchyma cells consist of vascular bundles are enveloped in the matrix tissue. Vascular bundles act as reinforcements in bamboo. A vascular bundle is made-up of several phloem fibres. A phloem fibre is made of several layers of pillar fibres. Micro-fibres in each layer of the pillar fibres are spirally arranged at a fixed spiral angle, which varies for different layers of pillar fibres. One can liken bamboo to reinforced concrete. The lignin is the concrete; it holds the cellulose fibers in place and keeps them from buckling. Lignin alone, like concrete alone, would crumble under the weight of a roof. The cellulose takes the role of the steel reinforcement bars. Cellulose on its own, like rebar, would buckle. Together, however, cellulose and lignin are an unparalleled show of botanical brawn, the whole being greater than the sum of the parts. Bamboo has been used for centuries, mainly in China, India, Indonesia and South America. Its resilience in the wind, shape and strength makes it an ideal candidate for construction. Besides its building purposes, it is also a raw material used in the pulp and paper industry. 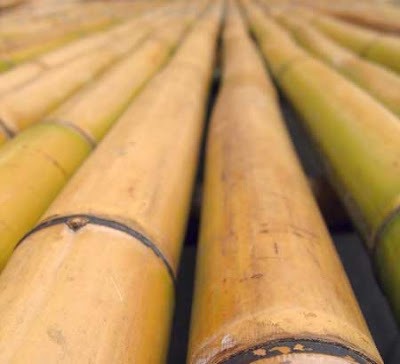 In Asian countries, bamboo has been used for household utilities such as containers, chopsticks, woven mats, fishing poles, cricket boxes, handicrafts, chairs, etc. Compare this to the modern steel industry, which started in the mid 1800's and is relatively young, though still basic to the world's industrial economy. What I'm trying to say here is that easterners have been using it for construction and other uses for many years and have an intimate knowledge of the material. Yet bamboo is new to the Western World. 1. It is evergreen, growing through out the year. 2. It is extremely fast growing, the fastest species are known to grow at a race of 2 inches an hour! 3. Unlike wood, usable bamboo material can be had in 3 years as opposed to wood which takes longer times to mature. 4. Unlike trees, harvesting bamboo does not wipe out the bamboo forest and cause related troubles like soil erosion. A bamboo forest also does not need replanting as mature bamboo has an extensive rhizome root system that continues to send up new shoots for decades! 5. Bamboo plantation is inherently a green activity. The energy needed to produce bamboo is approximately half that required for wood since it grows so fast and needs only simple tools and saws to work with. Hence, the carbon foot print from its production and processing is low. 6. Bamboo scraps are bio-degradable, and sanding it does not create skin irritating dust. Okay. So we know bamboo has been used for many many years and its strong and comfortable and all that. A quantification of its mechanical properties will be nice, won't it? The physical and mechanical properties of bamboo vary with the age of the culm (stalk) and its height. 1. Compression : Bamboo can withstand upto 52,000 psi's of compressive force. To put that into a better perspective : A short, straight column of bamboo with a top surface area of 10 square centimeters could support an 11,000-pound elephant. This is better than concrete! Compressive strength has also been studied to increase with bamboo height, and as one progresses from inner to the outer layers of bamboo. Another study found that the average tensile stress for wide bamboo samples and their modulii of elasticity were much lower to steel. Yet another study found that compressive strength and Young's modulus in the longitudinal and perpendicular to the grain direction were related to the age of the bamboo and height, with age having the most significant effect. 3. Composites with Bamboo fiber : Varada Rajulu studied the chemical resistance, and tensile properties of epoxy coated bamboo fibers and reported improved properties on resin coating. He and others also studied the chemical resistance and tensile properties of short bamboo fiber reinforced epoxy composites and reported that 30mm is the critical length for the fibers for maximum tensile strength of the composites. He also reported that percent voids based on the matrix volume decrease with increasing fiber content. This supposedly indicates the existence of good bonding between bamboo fiber and epoxy matrix in the composite. 4. Weight and Shear Resistance : Bamboo weathers shear exceptionally well, considerably better than other building materials. Though wood is light, it has weak points: grain lines and large knots, where branches leave the trunk. Both can give way under stress. Bamboo has neither. The specific gravity of bamboo varies between 0.4 and 0.4 (compared to the density of water, taken as 1) It is generally accepted that an increase in density of the culm is mainly due to thickening of the cell wall. properties of bamboo have much higher bending properties than the inner layer. The decrease of specific gravity and bending properties of bamboo from the outer layer to the inner layer across the cross section of bamboo culm is considered one of the interesting natural structural characteristics of bamboo. Several other studies have looked in detail at the other physical and mechanical properties of bamboo. Hi Ron, wow, great article on bamboo! I'll try to remember to link to it. I talked with Brano and he's gearing up to start selling his basic bamboo frames starting this May. His "bamboo composite" is fascinating, but too flexy to really use on a bike (yet). My photos on Flickr are almost all CC licensed, so feel free to use with appropriate attribution. Keep up the great work on your blog! Hi Nice Blog . In this, the body is studied by regions rather than by organs. This is of importance to the surgeon who exposes different planes after the skin incision and who, of course, must be perfectly familiar with structures as he explores the limbs and Human Anatomy study cavities. Hi Nice Blog . A recent development has been the appearance of a complete, sectioned human body appearing on the World Wide Web. The Visible Human Project presents transverse CT, MRI and cryosection images of two complete human cadavers, one male and one female, at an average of 1 mm intervals in human endocrine system. Thank you. I read every single comment. Be warned. I'm a 20 something engineer with a dangerous capacity to scrutinize a blend of topics fairly analytically, albeit with some humor.